Water treatment system, also called water filtration sterlizer system, is the process of purifying the raw water by a series equipment and devices to be drinkable. This system is to remove the suspended solid, color & smell, bacteria, and microbe, metal hydronium and chemical pollution contained in the raw water. The water purification process affects the quality of the products, as well as the transportation and sale. Thus, in the real operation, it’s effective to have some remainder of the disinfectant to kill the bacteria infected during the transportation. The water treatment system in Topling adopts the modern, energy-saving, and effective membrane separate technology, ozone sterilizing and UV sterilizing to guarantee the production safely and healthily. 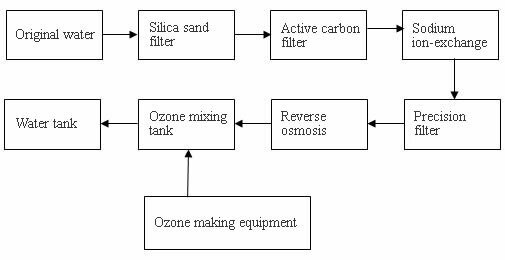 The water treatment equipment includes silica sand filter, active carbon filter, sodium-ion exchanger, precision filter, reverse osmosis, hollow fiber filter, ozone generator, ozone mixing tank and water tank, etc. Jiangsu Topling Machinery Co., Ltd is a professional manufacturer and supplier of water treatment system(water filtration sterilizer system) in China. Apart from water treatment system , we have many other products: bottled water (mineral water, pure water), juice filling production line, carbonated drink filling line and related equipments including rinsing filling capping machine, carbonated drink processing (mixer), coders (printer, labeling, shrink-wrappers), etc. Our filling lines have got the standards of CE, and ISO9001-2008. With good quality and affordable price, Our company successfully offers many production lines for many well-known brands at home and abroad, such as Coca Cola, PEPSI. If you need water treatment machines, please contact us.